Minus-8 is one of those names you rarely hear or see being worn out in the wild. 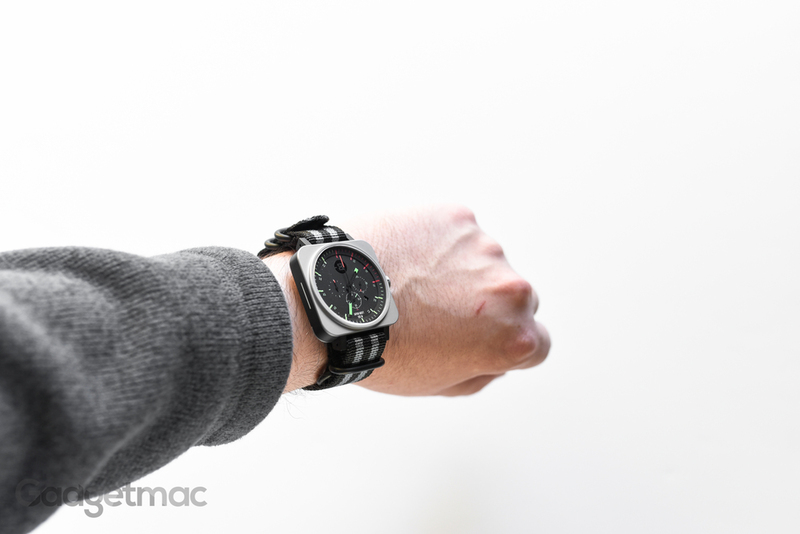 That's because they're a small time brand, and small indie brands really want to get noticed and rightfully so, which results in some really interesting looking timepieces that more often than not offer a great deal of value for your money. 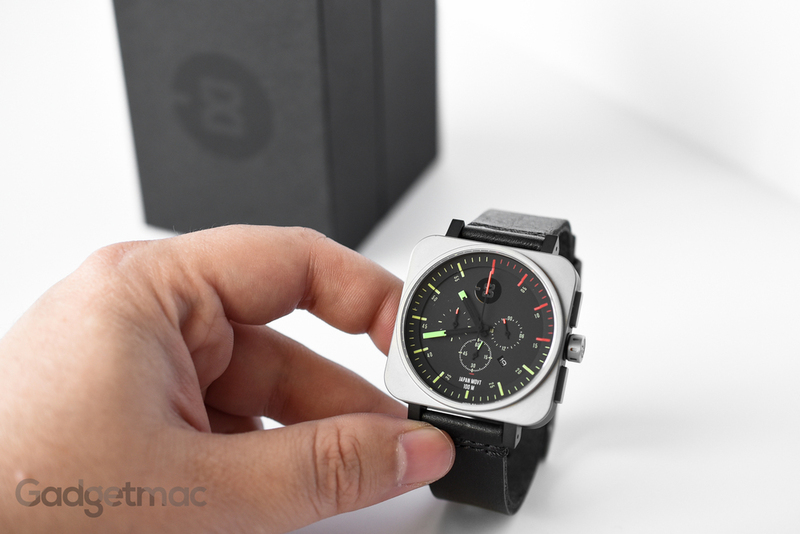 That's the case with Minus-8 and its newest offering - the Square Chrono. It's an aviation-inspired, Bell & Ross style timepiece we think is a complete stunner and at an affordable price point too. The Square Chrono combines the best of both worlds with its 40mm, solid squared-off casing made out of beautifully finished matte stainless steel and distinctive round watch face covered with a sapphire crystal. The company is based in San Francisco where it does all of its industrial design, hence the brand name play on the GMT -8 time zone, but it makes its watches in China. 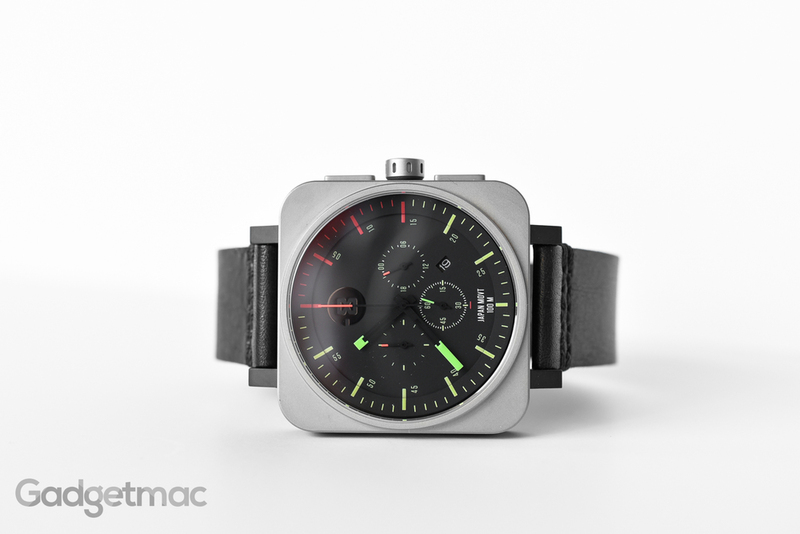 Still, Minus-8's watches are made to a very high standard and are as impressively made as other similarly priced indie and creative watch brands such as Autodromo. 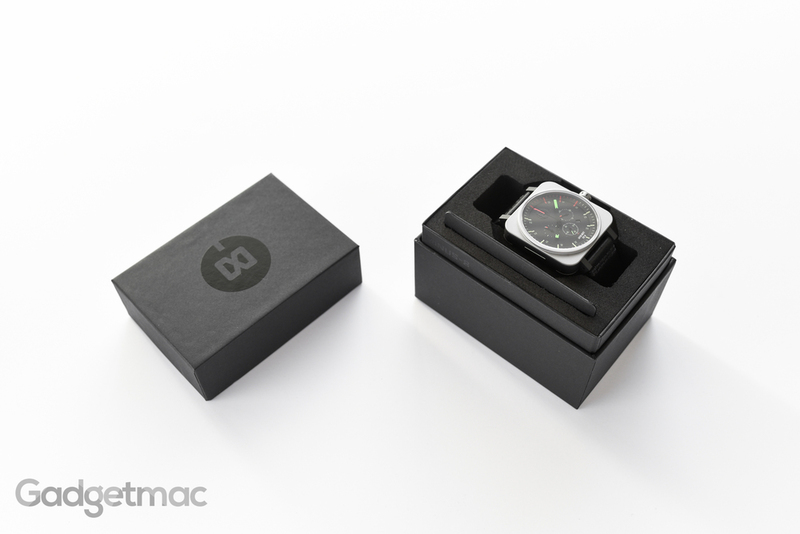 The Square Chrono will run you $398 and comes in four different colorways including an all-black case with a white face, an all-black case with a black face, an all-silver case with a black face – as well as in this black and silver case with a black face and bright colorful markings we've gotten our hands on. All models have a black leather strap except for the silver and black Square Chrono which is paired with a brown leather strap. 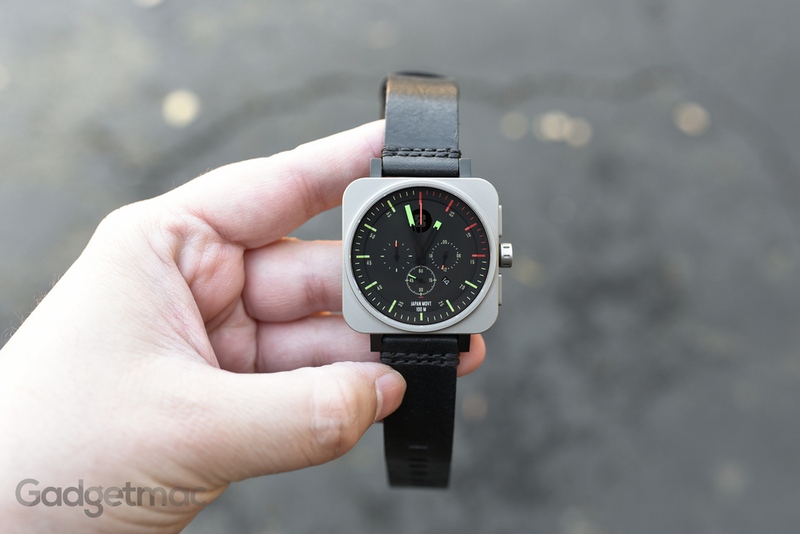 The Square Chrono's stainless steel case has a two-tone look to it with a matte silver face and beveled caseback that actually looks more like a titanium hue due to the bead-blasted PVD textured finish - while sandwiched in-between is a black colored stainless steel body resulting in quite an interesting colorway that works really well. The pieces are joined together seamlessly using with what looks like strong industrial hex screws. It's a well made, high quality piece that can instantly be appreciated from the moment you first pick it up. The fit and finish is unquestionably high, as it should be. 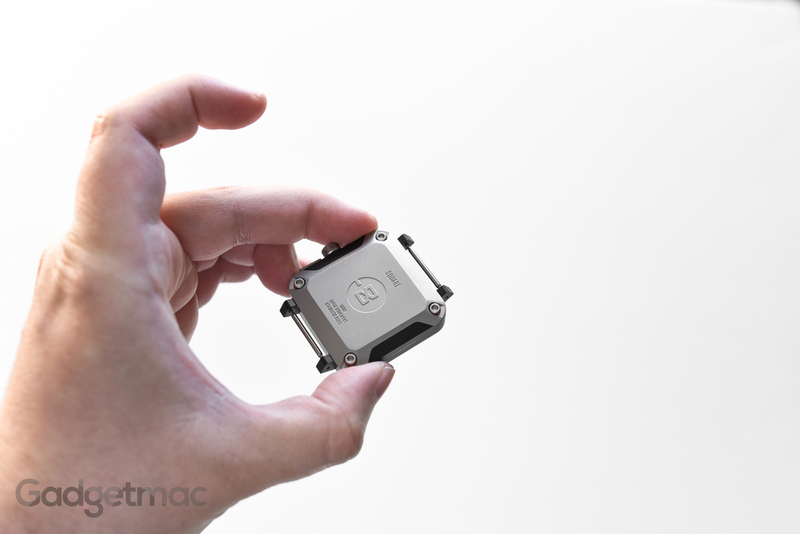 40mm might sound too small, but it's actually much bigger than it sounds due to the square shape of the casing. 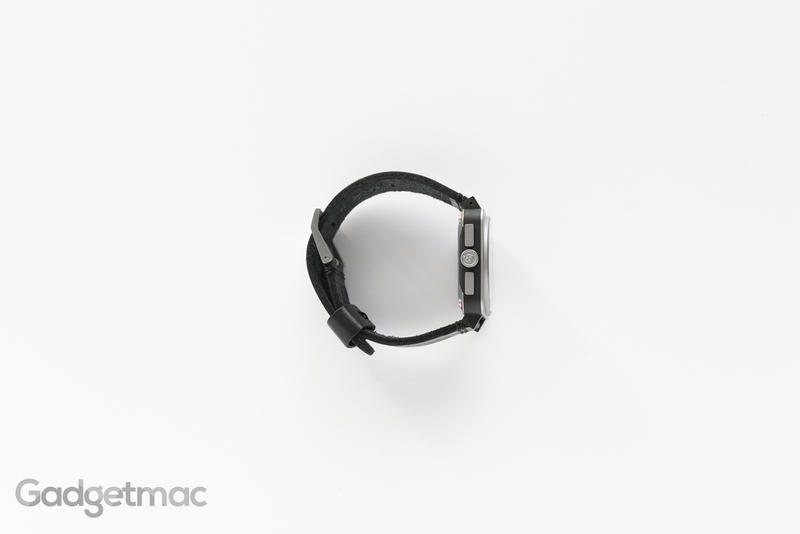 It's actually larger than the 42mm Apple Watch to give you an example. It fits perfectly on my 7-inch wrist. 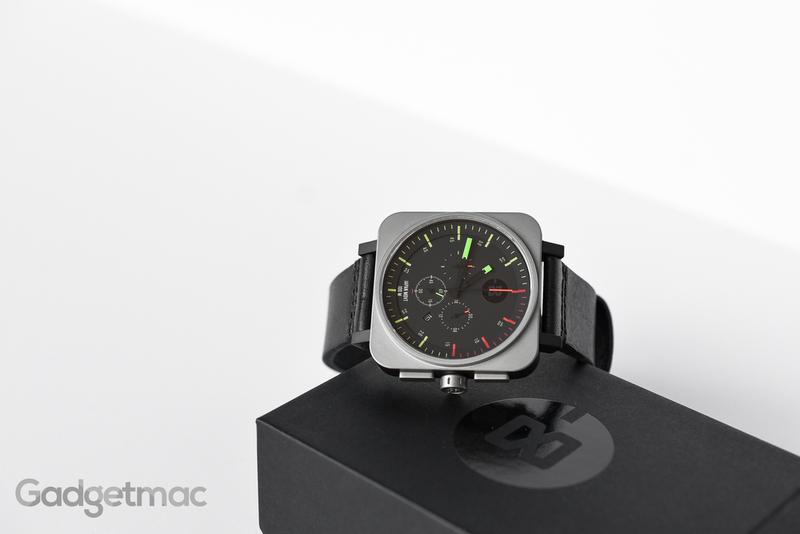 One of the most striking aspects about the Square Chrono is its dial design. It's very minimalist looking but still full of visuals. 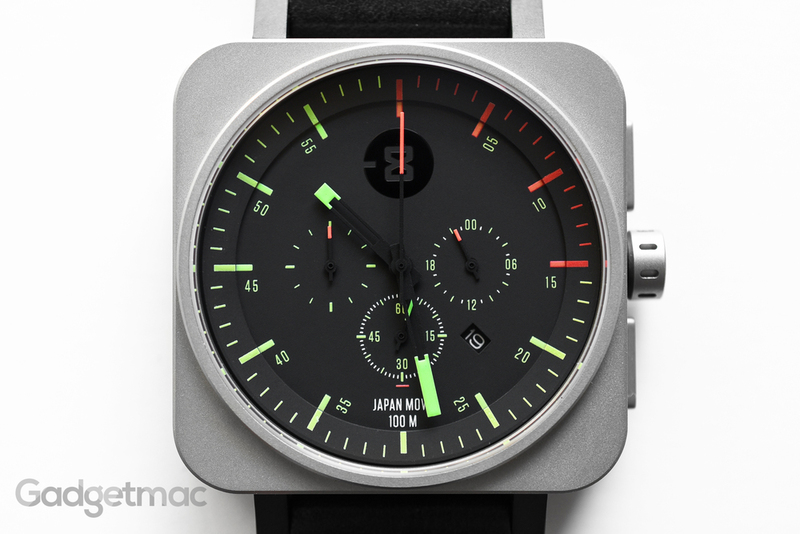 The thin painted-on luminescent dial markings share the same slim design as the thin subdial and main chronograph hands, which are painted black but have ends that are colorful in an almost neon fluorescent hue, which against the dial's flat dark gray background, look like hovering tips without attachments. The semi-skeletonized hour and minute hands are rectangular in shape and really compliment the squared theme of this watch. While the lume isn't very good, the dial is still very legible in any lighting condition thanks to the sharp detailed indicators and bright, fluorescent colors that just pop against the dark flat background. Something you don't see on every analog dial are these detailed small minute markings next to the thin, stick hour indices which help you tell time more easily if you're just starting out or simply used to telling time digitally. The Square Chrono is water-resistant up to 100m, and features a screw-down crown flanked by two side rectangular chronograph pushers. A small date window is accompanied by three subdials, a running seconds hand (bottom) and 24-hour hand (right) as well as a small 60 minute chronograph hand (left). 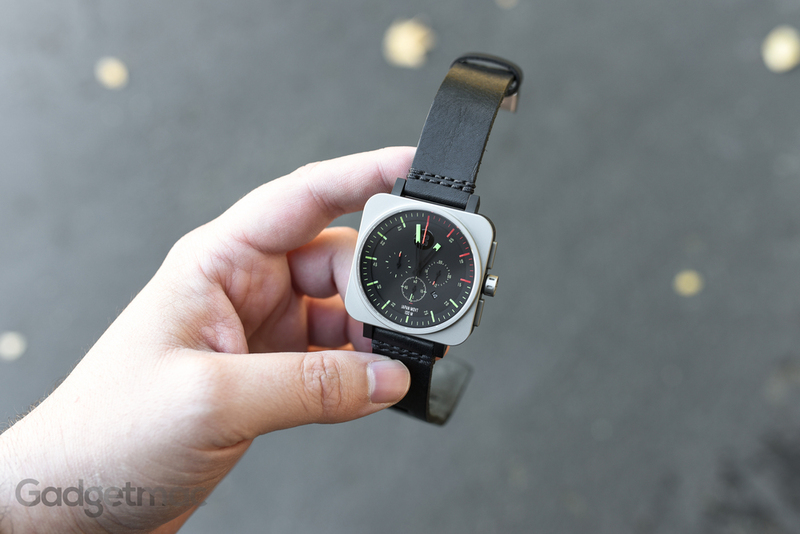 The branding on the watch is subtle if only because the black Minus-8 logo blends in with the dial’s darkness and isn’t spelled out, which we like. Inside, the Square Chrono is powered by a Japanese Quartz movement using the Miyota FS21. This means that the chronograph hand and small seconds hand subdial tick in one second interval instead of sweeping around. The strap is a narrow 20mm-wide straight piece of thick, vegetable tanned black genuine leather with double stitched lug termination that gives it that artisan looking style. 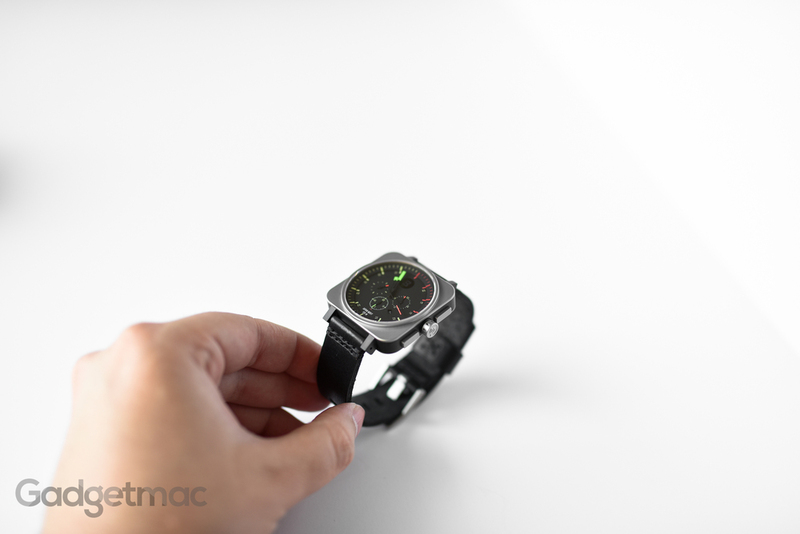 It's a very well made leather strap with a suede back that feels really good around the wrist. 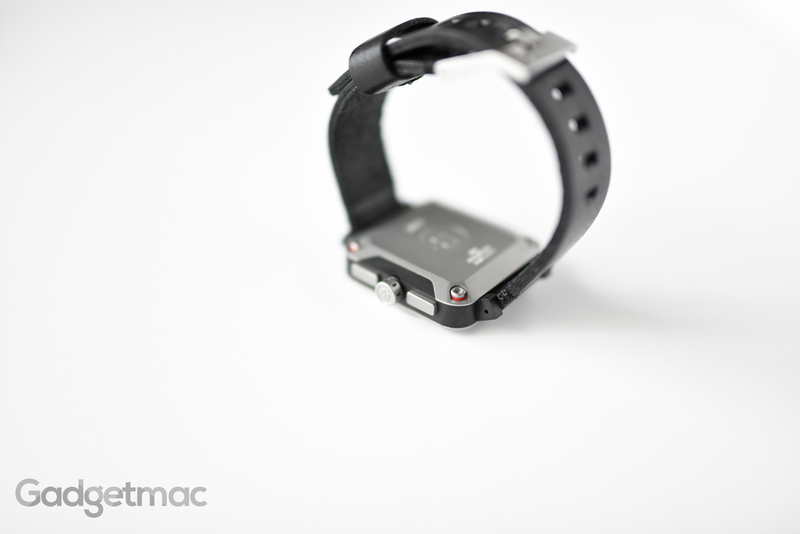 Like many others, the strap is initially stiff but does soften and break-in the more you wear it. Changing the strap is easily done by pushing one side of the springbar through the side lug opening. You don't need any special tools just a small jeweler's screw driver or a small needle that will fit into the hole. Granted it may not have the pedigree behind it, but we think that Minus-8’s Square Chrono is really one of the nicest looking aviation-style watches that’s sensibly priced, grabs attention and offers a premium quality fit and finish. 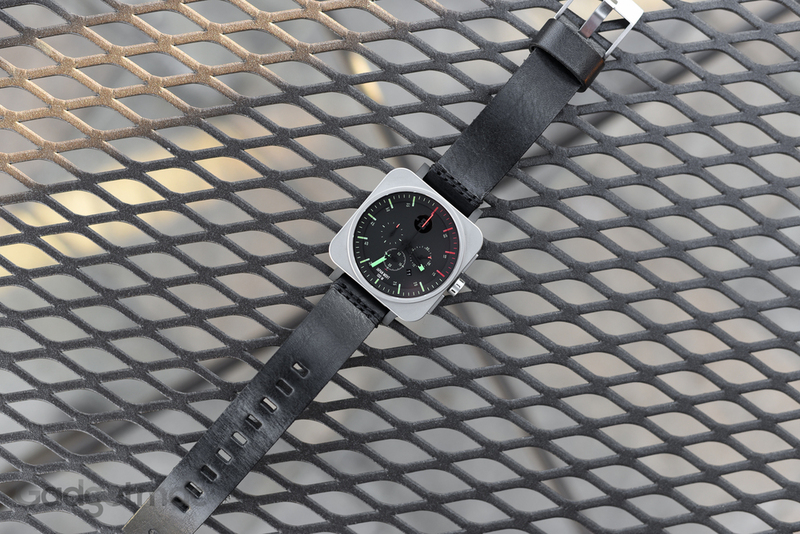 We love everything about the Square Chrono from Minus-8 except for its very few yet bothersome caveats such as the mediocre anti-reflective coating and luminance longevity.